*sighs deeply*May God rest her soul.Btw this APC attire on Bob manuel is a NO NO for the occasion,except if she was into APC when she was alive! May her soul rest in perfect peace. Amen! 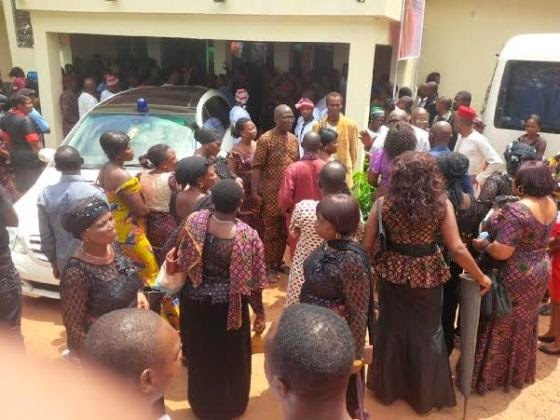 May she rest in peace, these guys sef.....even one is wearing political attire to a burial event . NB: The things you do for yourself are gone when you are gone, but the things you do for others remain as your legacy. The legacy she left in arts still lives ON. May her gentle soul rest in perfect bliss. Dirge! RIP late mrs Amaka..u wud surely b missed in d movie industry.. So bob Manuel doesn't have a black attire in his wardrobe that he will be in Willie obiano's campaign uniform... o di nma. One with the earth she is now. 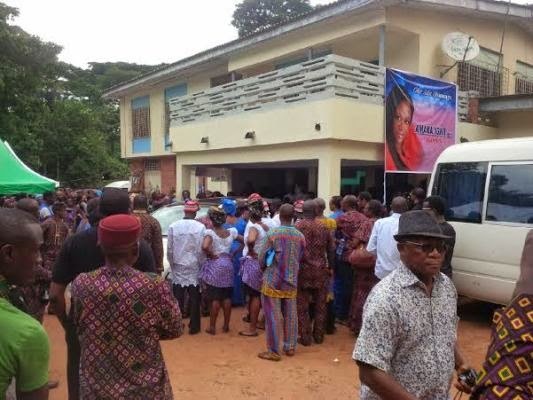 Why would bob Manuel wear that campgaining cloth to her burial. Very rude and disprespectful. Was he there to mourn or to campgain. Y re those actors smiling? Continue to rest in peace Mrs Amaka. Smiling and taking picture! Na wa o! RIP Achalugo nwanyi......nevr knw u were married in my villa...May ur Soul RIP. Jee nkeoma Adamazi, jee nkeoma Amy. Itz well wt ur soul. God knws best!!!!! Must you show your teeth? This is mourning period not party. Na wa for nollywood actors n picture! APC! I no fit laugh! It's APGA babe! Make we dey check well before we misyarn. Go borrow prescription-glasses o Bonita! Chai, na APGA cloth not APC oooo! Bob Manuel #EpicFailBbmSmiley Rest in peace icon of our time. May her soul continue to rest in the bosom of the LORD ALMIGHTY. May God accept your soul..
Everyone will go home oneday. Ur life on earth will determine where ur home will be - Heaven or Hell? No time. 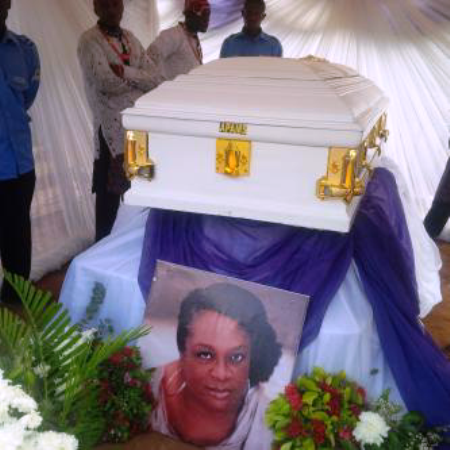 May ur soul find eternal peace Amaka Igwe. Ka chi fo! But black cloth no dey cost nah,why bros com dey where obiano Tshirt na wa oh. 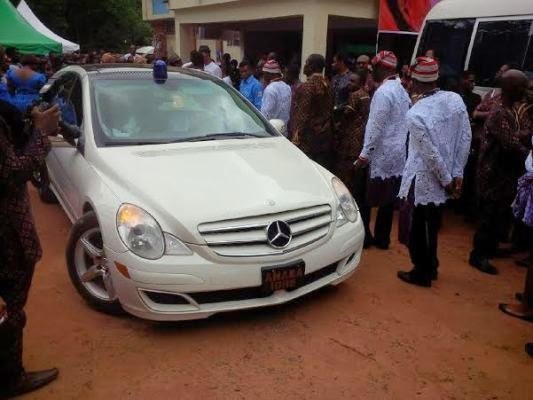 Bob-Manuel Udokwu is a FOOL for wearing that rubbish to Aunty Amaka Igwe's burial ! Ezigbo anuofia ! 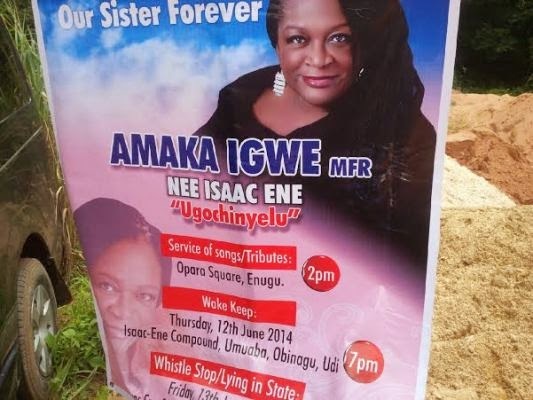 REST IN PERFECT AMAKA IGWE ! Nnekwu Adaugo ! Great Woman of Valour ! Abeg over look his dressing and focus on d burial....busy body! Continu to RIP anty Amaka igwe. Am from Arondizuogu too, Ndianiche Uwakaonye. Pls dnt crucify Bobmanuel, he was dere as a govt entity. Besides, does ur attire really count? Rosie Said............This is really so sad!!!!!!!. Amaka may you find rest in the bosom of our Lord and to her family,consolation.,.....Why is there so much pain in our world? a lot of people are hurting so much,Please Lord wipe away their tears. Maybe it's just me, but it's not right for people to be at a burial with a huge smile on their faces. Rest in peace Amaka Igwe. You've made a great impact in Nollywood. I Pray the loved ones you left behind will find comfort. It is truly sad that you're gone. AAAWWWWW !!!!! This world is just an emty space. EWWOOO!!!!!! Amakaaaaaaaa it's well with your soul. Too painful bt God knws best...May her beautiful soul rest in peace! Unu nekwa Bob manuel o watz he wearing? Just wondered why we never get to see the pictures of Amaka's immediate family members. Please can we see them? i want to see how big Ruby has grown now.Thanks.